MIAMI, FL — Sunday, March 2nd, Rabbi Zalman Lipskier, Director of Chabad at Emory University, Atlanta, GA, will be formally commissioned as the first Jewish Chaplain in Georgia’s military history to serve in the Georgia State Defense Force and Army, Air and National Guard. This is the second appointment of a Chassidic Rabbi to one of the country’s 25 volunteer State Defense Forces. “I’ve wanted Jewish representation in the Georgia State Defense Force and National Guard for a long time,” said Commanding General Michael McGuinn, “and I was absolutely thrilled when a friend of mine told me that a Chassidic Rabbi had joined the Maryland State Defense Force. He put me in touch with The Aleph Institute who is appointed by the U.S. Department of Defense as an Ecclesiastical Endorsing Agency and serves the Jewish military population worldwide. 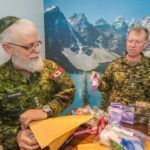 They sent out a request and Rabbi Lipskier answered the call.” The Aleph Institute endorsed the Rabbi into chaplaincy service and provided the financial assistance to procure his military uniforms and equipment. 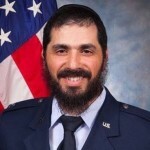 Rabbi Lipskier will be formally commissioned into Chaplaincy service at a graduation ceremony at The State Department Defense Complex in Atlanta on Sunday at noon. Lipskier says that he is grateful for the accommodations that the Defense Force made for him to attend training on Sunday instead of Saturday in order to honor the holy Sabbath. “I very much appreciate the support and consideration of the Defense Force to help me better serve the State Defense Force and National Guard volunteers, and for making the best interests of the soldiers a top priority,” he concluded. THE ALEPH INSTITUTE’S MILITARY PROGRAMS ensure the Free Exercise of religion guaranteed under the First Amendment of the United States Constitution for Jews serving in the United States Armed Forces. The Aleph Institute is appointed by the United States Department of Defense to recruit, vet and endorse Rabbis to serve as Chaplains in the Armed Forces, so that wherever a Jew is stationed or deployed he or she will have access to a vibrant Jewish program through an enriching educational experience with the vital resources and materials that Jewish soldiers and their families need to stay connected to their Jewish heritage, observe and enjoy the Jewish holidays and live a Torah-true life while in service. This is so wonderful! Such a kiddush Hashem and kiddush Lubavitch. May he have much hatzlacha and may the nevuah of swords being turned into plowshares be fulfilled completely. Not to nit-pick, but is there anyway to correct the luchos on his hat from being rounded to being square? We all know what the Rebbe and the gemorah say about that – it’s nogea to geon Yaakov. Regardless, this is great news and yet another testimony to all the great work that the Aleph Institute does. Shnoz (AKA reb zalman). How can I get a copy of that picture??? it’s a beautiful purim costume!!!!! We are so proud of you! You look great in uniform. Keep up the good work. Rabbi, You were there for our son, SPC Daniel Jay Agami, of blessed memory, and we will never forget that. Although he only knew you a short time while in basic training, your name came up often. He was strong in his Jewish traditions and convictions and being in the Army only made him closer to Hashem. Now he is with HIM. Our deepest gratitude to all you do for our Jewish Soldiers. just wanted to know about the right arm patch. was he in combat with the state defence force? 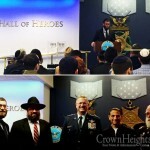 It’s a kiddush hashem to have another rebbe in our armed forces, welcome sir! as an active duty member of the U.S. Navy, i myself am curently stationed in okinawa, Japan. Our base chaplain is Rabbi Lieutenant scott bemel. We have a small jewish community out here, but we do what we can in the service of our country. Mazal Tov, and once again welcome to our large family!! Congratulations Rabbi Lipskier. And you just received congratulations from an Army Veteran and a humble gentile. Shalom. Congratulations, Rabbi! Sorry to be so late with the comment, but only just now stumbled on this article. I’m an active-duty Orthodox priest Navy chaplain, serving on Okinawa with Rabbi Bemel. A belated welcome to the brotherhood of the military chaplaincy. May He bless you richly in all things. Yes the patch is on the wrong arm…but I imagine (and I have no first hand knowledge) that this was a contrived shot. Thus the patch was put there to “get it in the picture” along with the American flag. Obviously no member currently wears such a patch on their right shoulder (though it is not infeasible that it could happen someday). While I applaud the Rabbi, and the attempt to “capture it all” in this photo, it never should have made it past the PAO.